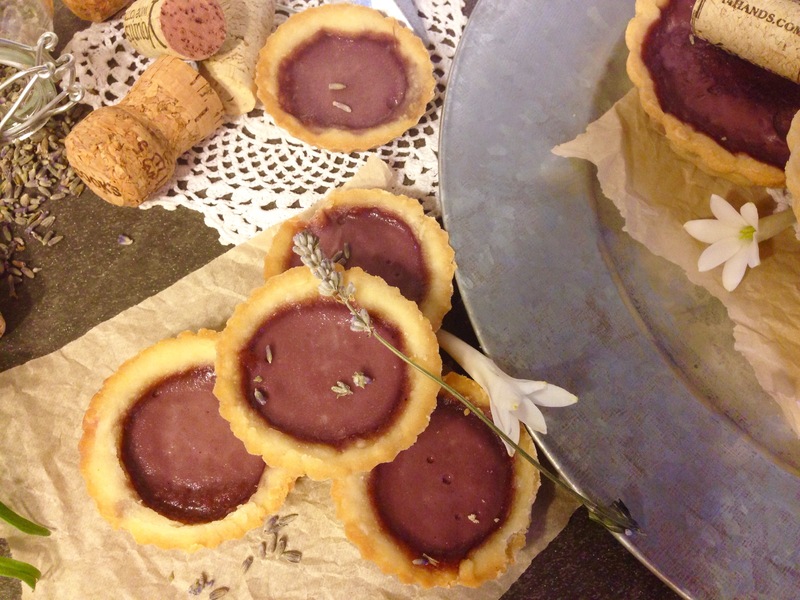 Here are a few of my favorite things… lavender, dessert and red wine! Not necessarily in that order! So my husband has been traveling out of the country for work more than normal lately. To places like Ireland and France. I wish I could join him but I have babies to raise! In good time I will eventually make it to these beautiful places with him but in the mean time I get to do some experimenting in the kitchen (when my boys are sleeping anyway). It’s what I like to do to keep myself busy while he’s gone. 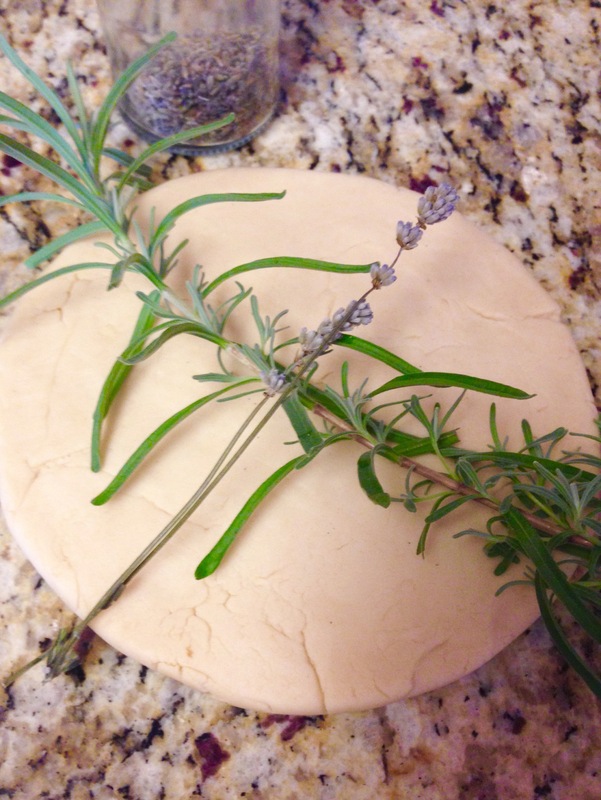 I have been craving custard and I had dried lavender that I had hung out to dry about four weeks ago from the garden. 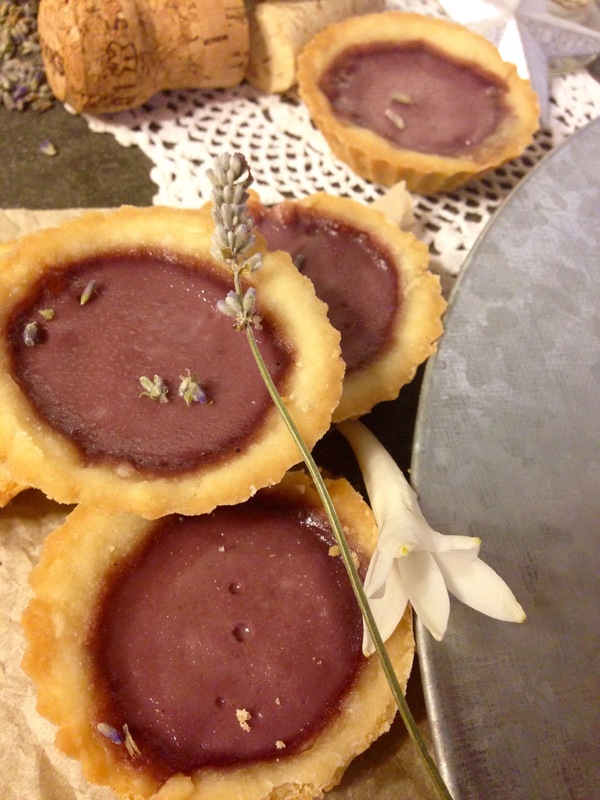 I thought lavender and custard… sounds divine! I know I said that my Lavender Coconut White Chocolate Chip Cookies would be my last lavender recipe of the season but I guess that was lie. I’m lavender obsessed! I just can’t get over this beautiful purple aromatic herb and paired with red wine! What’s not to like? 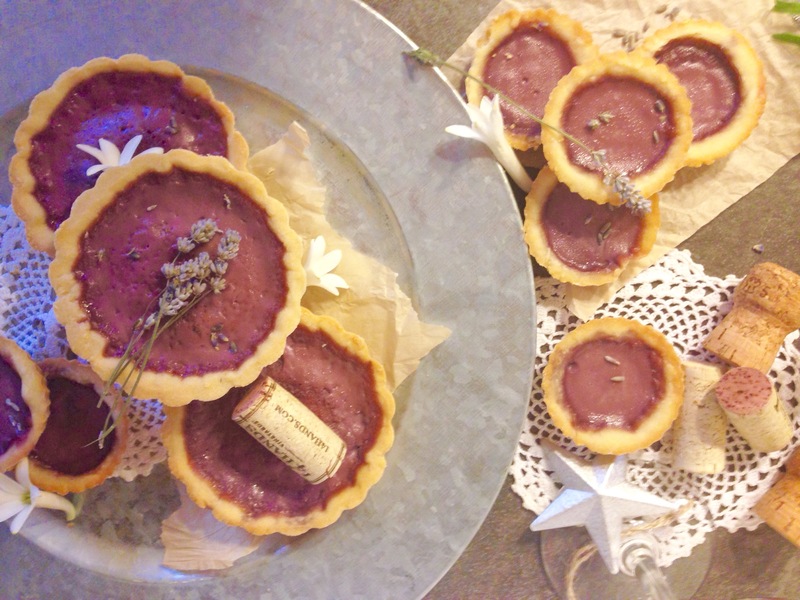 These tartlets were a little bit of work and I was nervous how they were going to turn out but they SUCCEEDED my expectations! The shortbread crust is super simple to make! Just three ingredients and although the custard takes a little time, y’all are just going to LOVE IT! The sweet lavender pairs nicely with the velvety tannins and the plum and blackberry undertones of the wine. 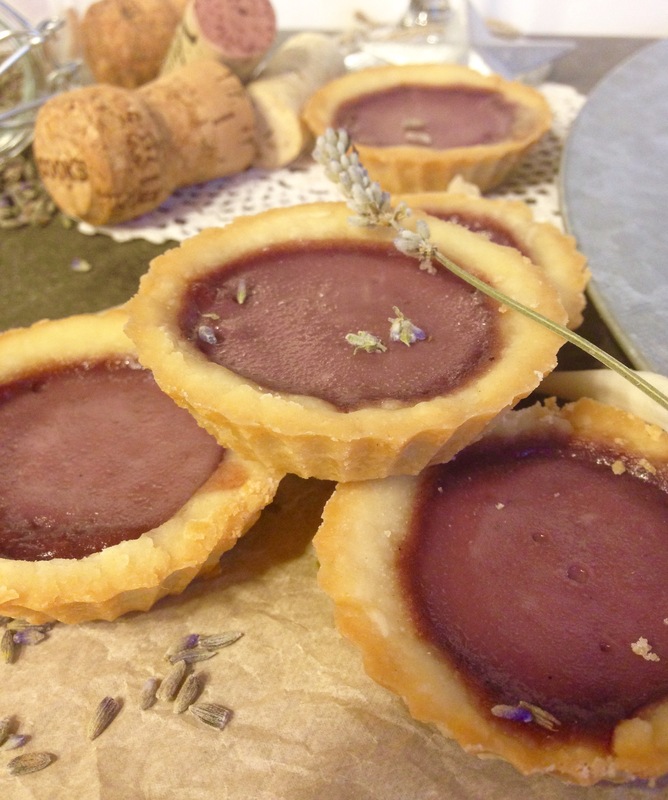 This recipe yields about 36 mini tartlets or 12 medium tartlets or one large tart. You pick! In a mixer cream together butter, flour and powder sugar until it pulls from the sides of your mixing bowl. Flour a work area, form the dough into a circle and roll it out with a rolling-pin to about 1/4″ thick. 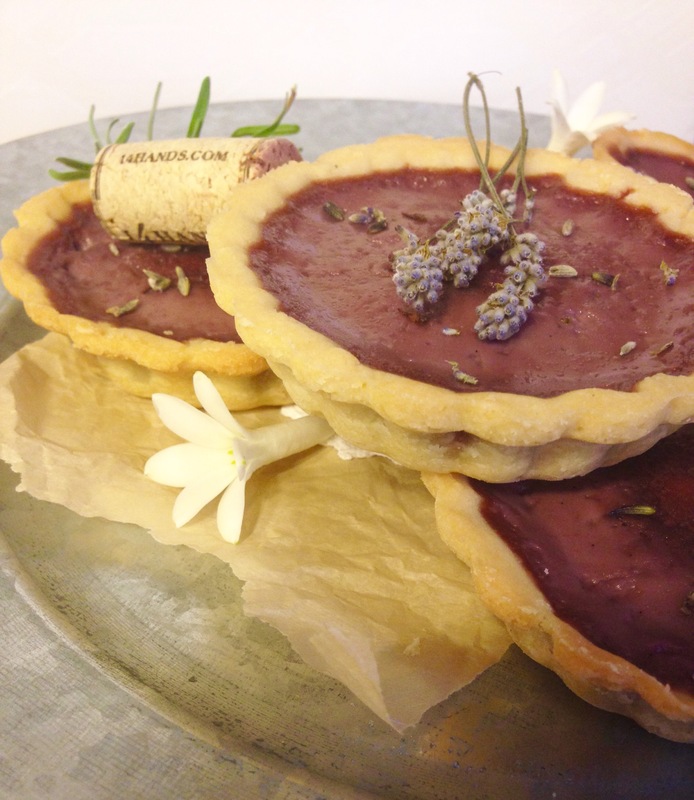 Get your tartlet pan and spray with a non stick cooking spray. Preheat your oven to 350 degrees. 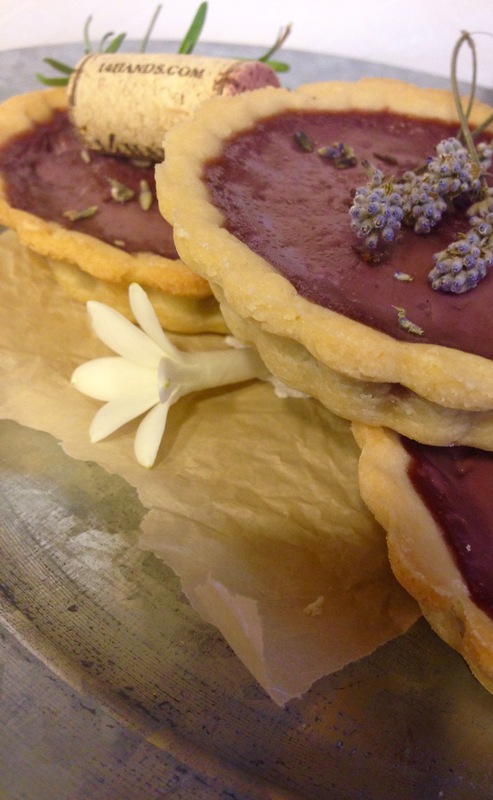 With a cookie cutter or cup press circles into your dough and place into the tartlet tin. With your hands press the dough down into the tin and cut off extra dough with a sharp knife. 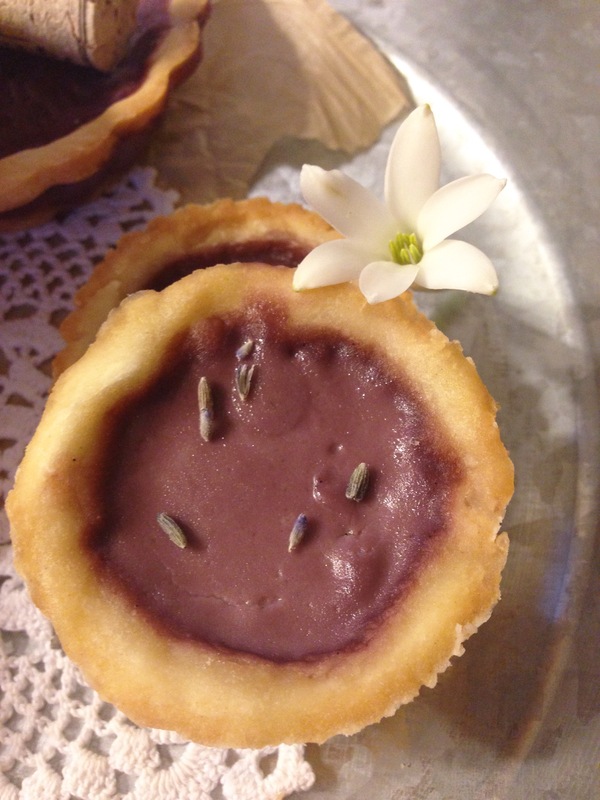 With a fork poke holes in the bottom of your tartlets. Bake for 10 minutes and set a side. In a sauce pan bring water to a boil. While you are waiting for your water to boil prepare custard. Once the water is boiled remove from heat and set a side.In a bowl mix sugar and egg yolks and set a side. In a sauce pan over medium-high heat add whipping cream, wine and lavender. With a sharp knife slice the vanilla bean down the center and scrap the seeds out of the bean with the knife. Place the seeds and the bean in the sauce pan. Whisk cream mixture together. Then heat the cream until its reached scalding point about 185 degrees and continue stirring while heating. Remove from heat and allow lavender to steep for 5-10 minutes. Then strain cream through a fine mesh strainer. Temper your egg yolks by slowly pouring about 1/2 cup of hot cream into the egg yolk mixture while whisking. You have to slowly bring up the temperature of the eggs so the yolks do not scramble. Slowly pour the rest of the hot cream into the bowl. Add food coloring if desired. I added about 4 drops of each to enhance the purple of the custard. Then ladle the hot cream into your tarlet crusts. 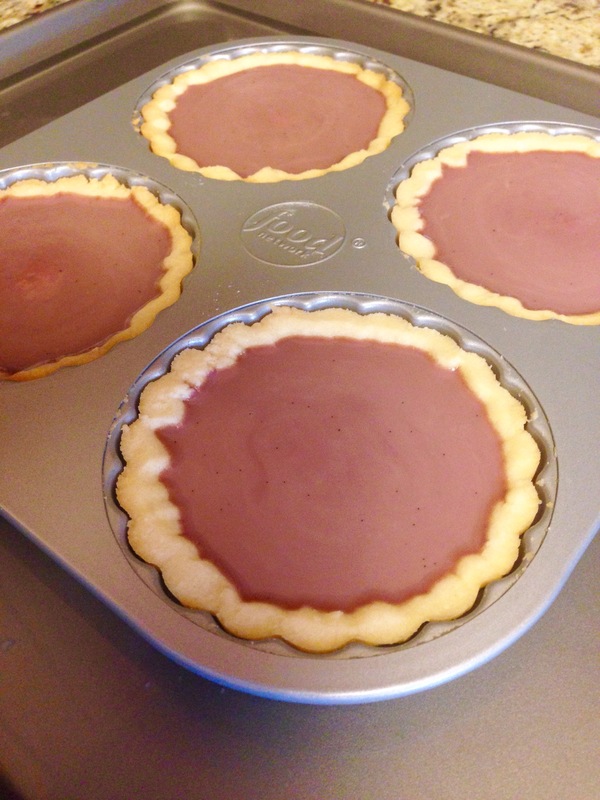 Pour the hot water from the sauce pan onto baking sheet and place your tartlet pan in the water. This water bath prevents the custards outside from overcooking before the center is cooked. 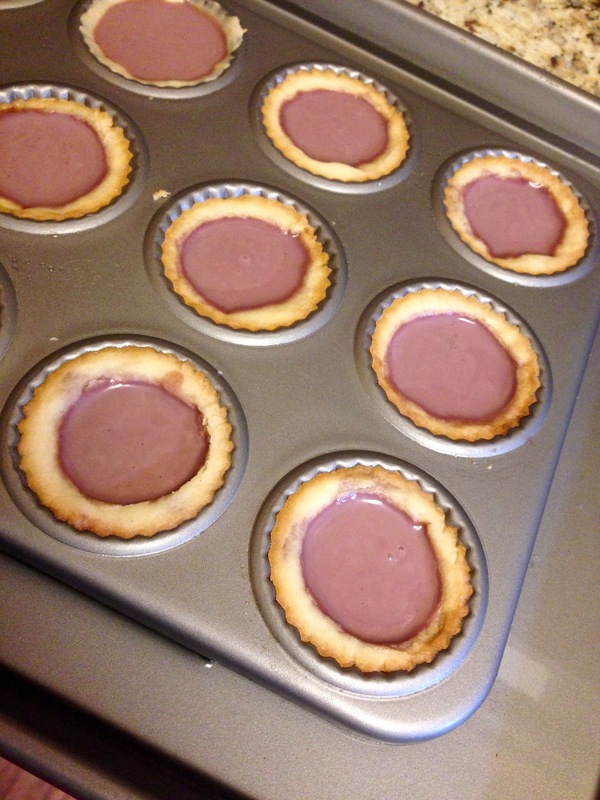 Bake mini tartlets at 325° for 12-15 minutes or for 20-25 minutes if you’re cooking a medium tartlet and a large tartlet bake for 40-45 minutes. Check your custard periodically. A good indication your custard is finished is if you can stick a knife in the middle and it comes out clean or when you shake the pan and they jiggle slightly. 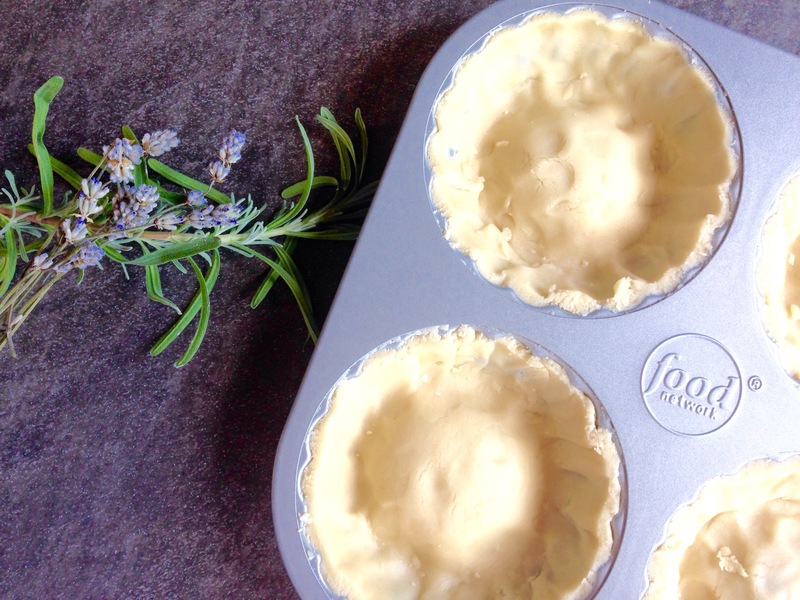 Allow tartlets to cool for 10 to 15 minutes then cover and placed in the fridge.Chill in the fridge for 2 to 6 hours before serving. 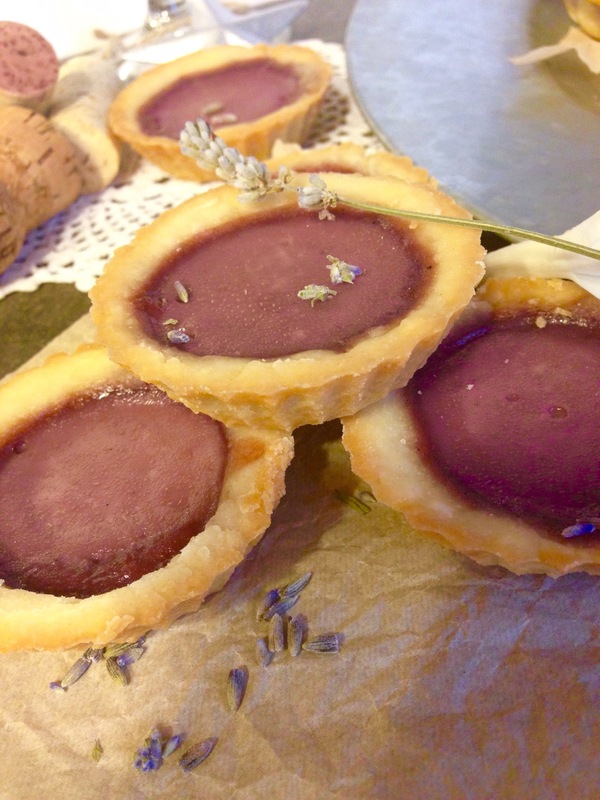 This lavender and red wine custard tart is super savory, it’s a unique flavor combination but oh so good! I love to cook with red wine but I typically do not put it in desserts. I just might start doing this more often!